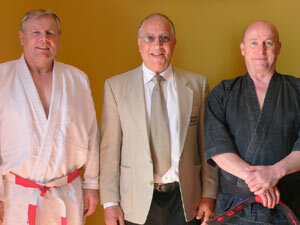 Our President John Goldman welcomes guest instructors Gordon Lawson 6th Dan British Zen Judo Family and Anthony Richards 5th Dan ju-jitsu. 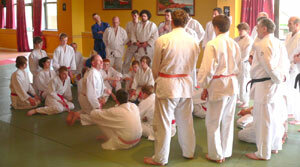 Once again, for the 28th year, our National Course ran at capacity. 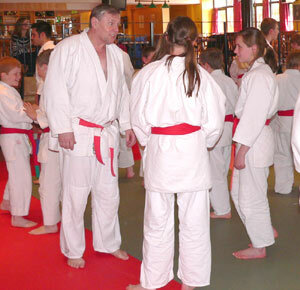 Over 100 youngsters and 30 plus adults joined in the activities; judo, ju-jitsu, karate, body combat and grading, with 60 families staying in caravans on site. And boy - wasn't the weather great too. 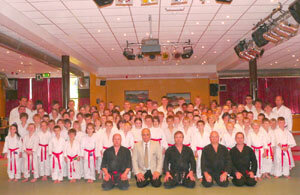 Danny da Costa 6th European Silver medallist and World Masters Champion was on hand again this year to give his expert tuition. 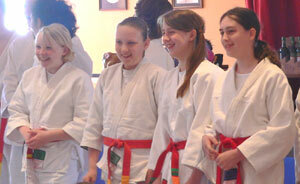 The youngsters had a lot of fun too. Something caught the eye of this happy bunch of enthusiasts. 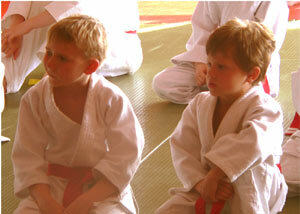 And here, two of the very young 'would be champs' quietly take it all in. 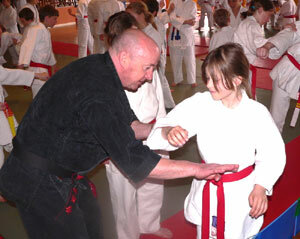 Sensei Gordon Lawson shares a moment with two junior students. Near to the close of the event came a series of displays, both junior and senior. 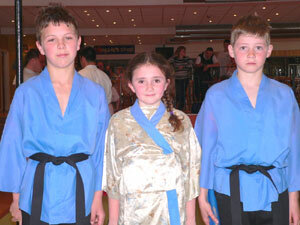 Josh, Megan and Scott, dressed in colourful costume, gave a spell binding performance of Itsutsu No kata which had been choreographed to a story and music. And finally, following the announcement of all the new junior grades, two special presentations were made by the President. 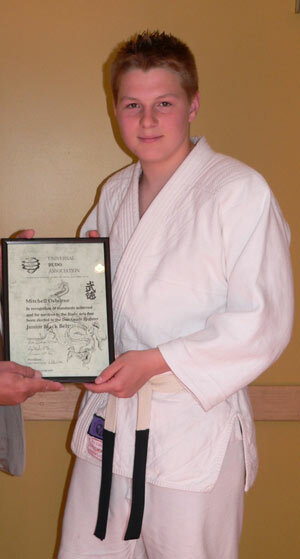 Fifteen year old Mitchell was awarded his Junior Black Belt. Congratulations to both of them, and everyone who took part. And a special thank you to all the mat marshals who ensured that everyone was kept safe, and to parents and families for their continuing support. See you next year - the planning has already begun! 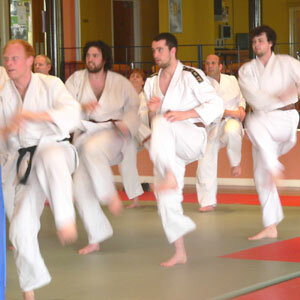 The course will again be held during the Easter school holidays 2010, Friday 16 April to Sunday 18 April, with caravans available from Wednesday 14.